This hidden camera has no software installation or confusing directions. 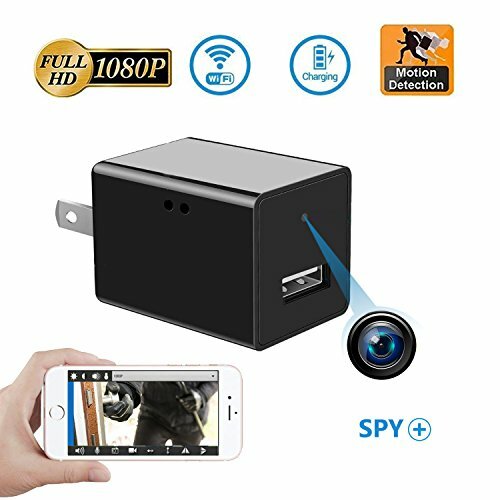 Grab our Spy USB charger Camera Now! 1). The hidden camera don't support 5G network, 2.4G Hz will works. 2). This is a guide video: https://www.youtube.com/watch?v=yHHnfR_45lI. 3). When you change the network, please RESET the hidden camera; Make sure the plug is energized when resetting. The set up as the first time. 2).Perfectly inconspicuous, it charges iPhones and Androids just like any regular charger - and with 1.5A charging power, so no one would ever know it's one camera. 4).you can watch what's going on at home, work at all times - and enjoy remote protection, security, and accuracy of recording when and where you need it most. 1).Two-in-One Hidden Cam:The mini camera looks like a regular usb wall charger, you can use it as a adapter for charging, also as a secret camera without anyone knowing it for any security need,nobody will realized this is a mini hidden camera. 2).Remote Recording Camera: The hidden camera can connected to the internet, so you can live-stream your footage from anywhere in the world. Just download the app and you can see all of the action on your phone. 3).HD Display: Full HD view with 1080P resolution, the USB hidden camera is definitely a perfect tool for monitoring the performance of babysitter or recording the pet's activities while you go outside. 4).SPY Camera: You can easy to operate spy camera charger. Camera's features: Motion detection - Charge phones - Loop recording - Record on SD Card. 5).100% Satisfaction Guaranteed: We firmly believe that Benfiss Wi-Fi USB charger hidden spy IP camera with motion detection is the best product on the market for your home security. If the product doesn't satisfy your needs, we can promise that you can get a full refund from the order. If you have any questions about this product by Benfiss, contact us by completing and submitting the form below. If you are looking for a specif part number, please include it with your message.